NEVADA CITY, Calif. February 8, 2019 – The stretch of state scenic Highway 20 between Nevada City and the junction of I-80 is at times hazardous, both for cars and wildlife. This is the good news story behind our mention in Happening Now of a fox sitting in the roadway on Hwy 20 near White Cloud yesterday morning. The grey fox sitting on the edge of the roadway caught the eye of Justin Wages, Land Manager for Placer Land Trust, who was driving to a staff retreat. On his Facebook page, he described what happened next. “I saw a small furry lump huddled on the edge of snow covered Hwy 20 just past White Cloud. As we slowed for a better look we could tell it was a grey Fox and it appeared to be alive but freezing to death. The car in front of us noticed it too and we both pulled over to check on it. Turns out the women in the other vehicle volunteer at a wildlife rescue in Nevada City and they had an animal box in their car so Lynnette tried to slow down traffic while I approached the Fox fully expecting it to flee. It didn’t. I removed my flannel and wrapped it around the poor thing and scooped it up. It was so cold and disoriented that it didn’t struggle. It just dropped it’s head on my arm and relaxed. I brought it to the two women and we discussed the best option to help the little thing. We both agreed Gold Country Wildlife Rescue was the best place for it and they would interrupt their snow day trip to drive back down the hill and contact Gold Country for assistance. I didn’t catch their names but I want to thank them for their efforts. It’s heartwarming to observe such acts of kindness. The morning temperature of 23 F at the 4,420-ft elevation alone did not account for the fox’s unusual behavior. 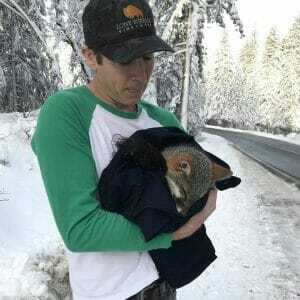 Once he was brought to Gold Country Wildlife Rescue’s Intake Center, it became apparent that he likely had been hit by a car and suffered from a concussion. “He will be with us for a while for treatment, but did not suffer any broken bones and will likely fully recover,” said Sallysue Stein, GCWR’s spokesperson. She also pointed to other wildlife the organization rescues from the freezing temperatures, like a golden-crowned kinglet found in the snow yesterday. The bird was warmed up and is able to fly once more. Mr. Fox this morning, alert and warm! Photo courtesy GCWR. The fox is up and moving today, but still showing signs of a concussion. He should be fine – just needs some time and TLC to be ready to go back into the wild, according to Stein. 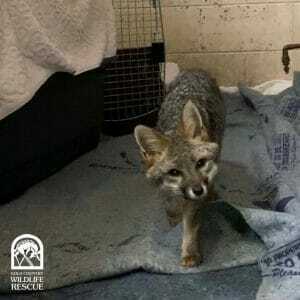 The rescue’s volunteers care for injured animals year-round and the Wildlife Intake Center located at 11251 B Ave. in Auburn is open 7 days a week, 365 days a year. 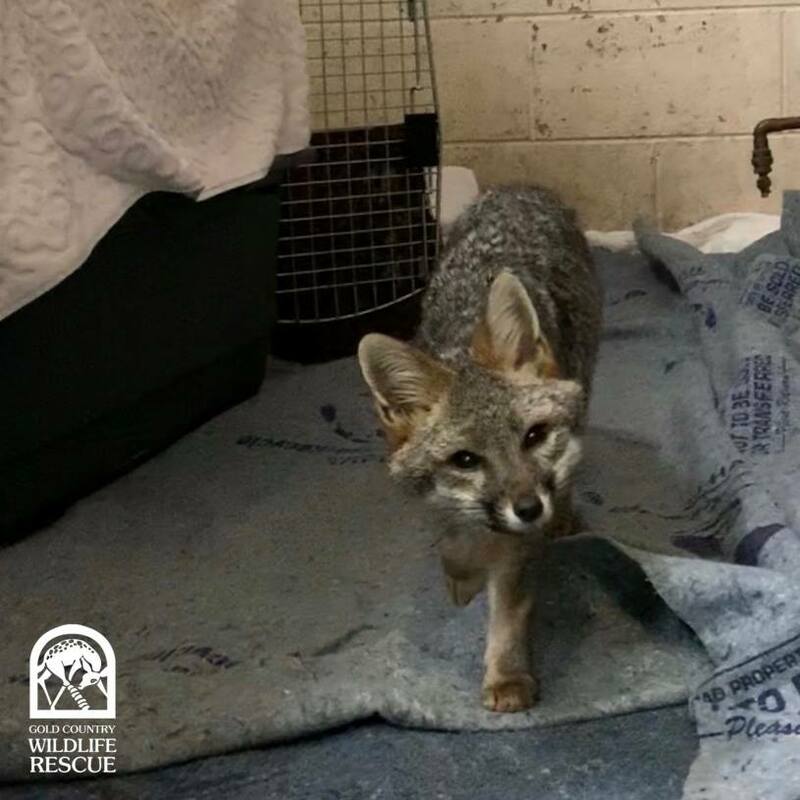 If you’d like to support Gold Country Wildlife Rescue’s work, they are happy to have new volunteers and all your donations are fully tax-deductible. Find out more about GCWR here and thanks to Justin for caring.